Tired of watching light duty step ladders fall apart? Does the term Rickety come to mind when you think of your current step ladder? 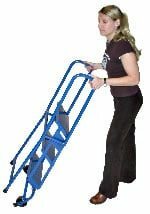 Try Ballymores new Lock-N-Stock Folding ladder – 58 degree slope with 7 deep steps for easy climbing, welded steel construction rated to 350 lbs.